The words design and semi-industrial, which are part of the subtitle of this book and are here underlined, are an evidence of our approach, as designers, to the world of Portuguese confectionery. The Fabrico Próprio project has as its underlying idea the introduction of a new perspective over this activity, free from preconceived ideas, on what it represents to a professional class, and also its historic and cultural importance in Portuguese society. But no Portuguese dares to bake any of these cakes at home. In the end, that is not even necessary, as they know they can trust the work of confectionery masters and other professionals of the field. As such, all these elements that make this ‘product-cake’- one of which being the very name of each cake – are part of the process governing its manufacture. This process is in all accounts similar to the design process, the so-called ‘project method’. A conventional notion of design is ‘where technology, art, and culture converge to solve the problems of everyday life’ [in Busch, Akiko, The Uncommon Life of Common Objects. New York, Metropolis Books, 2004, pg 16]. With the content of this book one can easily make a parallel between confectionery and this definition, proving that cakes are themselves an example of designed products or design objects in their own right. These products – conceived according to a method based on design, or project, procedures – are also developed according to processes of industrial manufacture. It is precisely in the atypical junction of these two words that our choice for the term semi-industrial is grounded. Allow us to explain. First of all, the origin of the word manufacture, which from the latin manu factum means ‘hand made’, and describes the way these cakes of daily consumption are prepared. All the final shapes are achieved by skilled handling of utensils, ingredients, dough, creams and icings, by one or more professionals; the decoration and finishing of each cake is done individually, according to a specific recipe. We are thus able to affirm that everyday, in Portugal, each cake is made by hand according to a recipe – if you will, an initial project – whose author, save the odd exception, we ignore. It is because of this absence of authorship – an absence we, after months and months of research, failed to dispute or confirm – we can consider that the majority of these products are manufactured according to a traditional recipe, in many ways similar to handcrafted products. However, we failed to observe in this type of confectionery other factors that characterise craft as material production. The use of local or regional raw material, found in cakes such as the typical Algarve sweets made with almonds or carob (ingredients mainly found and identified in this region), is not taken into account in the manufacture of the cakes featured in this book, which are made from five base-ingredients that can be found anywhere in the country. 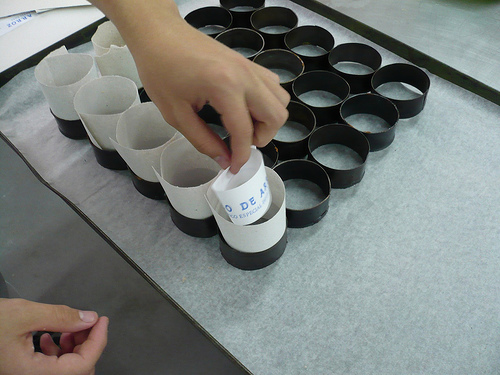 In the same way, the identification of a product with a place is only true for the so-called regional cakes – like the Fofos de Belas, Pastéis de Tentúgal or Cristas de Galo from Vila Real – but not seen in other confectionery cakes, even if many of them originated from a specific city or region. Jesuíta is a good example of that, as it originated from the town of Santo Tirso, something as unknown as irrelevant for the majority of its enthusiasts. Another factor is the variations of each cake, created individually by each confectionery baker, regardless of the original recipe – without compromising the essence of the product. A Palmier is still a Palmier be it simple, covered or filled – and it still is a Palmier despite the eccentric ingredients that could be added to it. There is then room in this tradition – or initial project – for individual creativity. That said, these products are made by hand, according to a recipe much less traditional than what we could imagine at first. And when we have a closer look into the process according to which they are produced, we can attest the use of the word industrial to speak of manufacture. We use this term as a direct reference to the array of appliances and tools (dough mixers, processors, refrigerators, ovens, etc. ), ingredients (specific margarine, pasteurised eggs…) and sequential methods of preparation (mixing, resting, stretching, rolling, turning…), used in the making of these cakes. For a better understanding of the scale involved in the above-mentioned electric appliances, we can say that those include mixers capable of mixing homogeneously 60 litres of dough, refrigerators with a capacity of up to 500 litres, or ovens capable to reaching up to 400° C.
It is also pertinent to mention the two typologies of establishments that manufacture these products. The Fabrico Próprio patisseries, where the cakes are prepared daily to meet local consumption, and the so-called wholesale houses, where cakes are prepared in larger quantities in order to be distributed to patisseries, cafes and other food establishments that don’t have fabrico próprio, or their own production. Both in Fabrico Próprio patisseries and wholesale houses, the machinery, procedures and kind of ingredients are alike. The difference of each production is in the decoration, quality and/or specificity of ingredients, and also in the final presentation of the products. In our research, we realised the fabrico próprio establishments are in general more careful and attentive when it comes to every step of manufacture and sale. In these places, the master confectionery baker – the producer – creates a signature that the ‘house counter’- the client – grows to enjoy and appreciate, making often one specific patisserie become a reference for a particular cake, and a landmark in any Portuguese neighbourhood or town. This dedication applied to an industrial manufacture proves, according to us, that the negative assumptions frequently associated to the word industrial in the universes of gastronomy and food may, in many cases, be untrue, as we believe that there is excellence, rigor, and dedication in the manufacture of these products. We can conclude that the fabrico próprio cakes in Portugal are not made in huge amounts, by gigantic machines monitored by workers in anonymous factories. That’s not what we think when we buy or eat them. We do not think also that they are religiously made by an idealised person, who produces a very small number of cakes according to a secret, centuries-old recipe, which shall be eaten by only a few, in a respected ‘sanctuary’ of Portuguese confections. That is then the reason for our choice of the expression semi-industrial for this particular kind of food production: All these cakes are manufactured by confectionery bakers whose face we have never seen, but in whose talent we blindly trust. They are not made by machines, they are made with machines. They are not produced in a large scale, they are produced in sufficient amounts to fill counters every morning. They are not from a specific convent or region, they are national – and some are even global. The daily project of this confectionery is simpler than the rich tradition of Portuguese culinary and gastronomy, but more unique and precious than any other synthetic product that could ever be offered to us by the food industry. Still relating to the fact of being designers, we can say that this theme interested us also due to other components of the industrial cycle: the time involved in the production of these products, the shapes, the people involved, the consumers, the sociability aspect of consumption, the places and, last but not least, the cultural legacy – not duly documented up to now – made us dedicate our bodies (now somewhat heavier) and souls to this universe. Whilst a project for a more years) to reach the final consumer, in the product-cake case the transition between project and final object has much shorter working times, allowing for a visualisation and fast analysis of the results in a consumption circuit. That’s what we say when we talk about Fabrico Próprio, about products of fast project, fast manufacture and fast (very fast indeed!) consumption, for we find in this material universe a true source of inspiration, creative richness, and possibility for innovation, where there is still much left to be explored. By connecting this activity to the design process, we also wanted to create contact points between two apparently unrelated fields. To us, true innovation happens when creative thought is applied to other fields of knowledge and creation of wealth, allowing for true intersections of disciplines, industries and cultures. And it is in these intersections that horizons are opened, surprises happen and the most unexpected, surprising and meaningful results are produced. We would like to think of this book, and the project around it, as one of those precious intersections.